With it being summer the beach tends to call our name, at least for me it has been! I’m not sure if the humidity has been turned up this summer or if being pregnant is just making me extra hot, but the cool salt water is a great relief to the high temperatures. The only negative thing that I have to say about the beach is the damage that it tends to do to my hair. The salt water always leaves my hair extremely dry and frizzy causing me to look like a crazy woman! I also don’t care for the lingering salty smell that can stay in your hair for days. My solution is DIY’s for your hair after the beach, all which include coconut oil to help replenish the moisture to your hair and make it smell delicious! If I didn’t plan on going to the beach or just want a really simple and quick way to bring my hair back to life I simply use just coconut oil! When in the shower, before you shampoo or apply water to your hair, scoop out a tablespoon or so (depending on your hairs length) and coat your hair with coconut oil. Make sure to apply the coconut oil all over and deep within your scalp. When this is complete, shampoo as normal and do not use conditioner. You may need to shampoo twice to remove all of the oil from your hair. Blow dry hair as normal for soft and silky locks! If you are feeling like you want a bit more of a hair mask to tackle those tangles try using coconut oil and avocado on your hair. Avocados are packed with Vitamin B, which helps promote hair growth, as well as Vitamin E, which repairs and protects your hair while the lauric acid in coconut oil penetrates deep into the hair to promote protein growth! 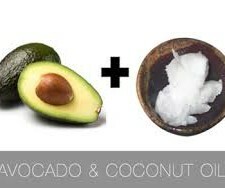 Start by taking half of a ripe avocado and mashing it into a bowl. 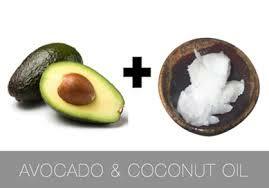 Add 2 tablespoons of softened coconut oil and blend until you create a creamy consistency. Using a comb, comb mixture throughout your hair starting from scalp and working your way down. Leave on for 30 minutes, covering your hair with a plastic bag and quickly going over the hair with your hair dryer. Let your hair cool and rinse with cool water, the heat helps to open your hair follicles! Rinse again and shampoo as normal. To prevent sun or water damage AT the beach you can prep a hair spritz to keep your hair hydrated. In a spray bottle, mix together 1 cup warm water, 1 tablespoon coconut oil, 1 tablespoon gel and 1 tablespoon sea salt. Shake all ingredients together within the bottle and spray generously to your hair. Not only can you take this with you to the beach to re-apply but it also creates a great natural wavy look in your hair. The perfect look for your day at the beach! Remember to always wear sunscreen and re-apply every few hours. Especially to the little ones that we have, as their skin is a lot more delicate than ours!